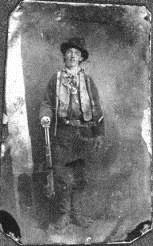 Probably hundreds of books, articles and films have been written over the years on the subject of Billy the Kid. Considered by many an outlaw and villain, and by others a folk hero, he was called Henry McCarty, Henry Antrim or Billy Bonney. But whatever his actual name the Kid’s legend lives on. No matter your personal view of his story, it is tied to the wild Territorial days of New Mexico history and has remained an immensely popular narrative to the present day. 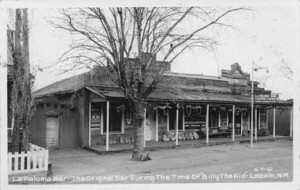 Hundreds of tourists visit the Lincoln Historic Site each year, where the historic courthouse and Tunstall Store are still standing, as well as Fort Sumner, the site of the Kid’s burial. One of the earliest accounts is The authentic life of Billy the Kid, the noted desperado by Pat F. Garrett, Sheriff of Lincoln County. It was first published in Santa Fe in 1882, and is sometimes called “Pat Garrett’s Life of the Kid”. His first-hand account of the Lincoln County War and his dealings with the Kid, as well as his research by means of interviews with others who knew the Kid present a “true and concise account of the principle interesting events” of this period. The book has many historic photographs and images of contemporary documents. Garrett’s book is still in print from Cosimo Classics (2012). A more recent work which examines the relationship between Pat Garrett and Billy the Kid is To hell on a fast horse: Billy the Kid, Pat Garrett, and the epic chase to justice in the old West by Mark Lee Gardner. The “twin destinies” of these two larger than life figures seem almost pre-ordained in this fast-paced telling of the manhunt for the notorious outlaw. Gardner is a well-known musician who performs historic Western cowboy songs, as well as an historian and author. His account of these two famous Wild West larger than life characters gives the reader an understanding of both men who are now forever linked in history. This book is available from William Morrow Paperbacks (2011).